The Infinite I Database Migration Tool for DB2 for IBM I (DB2/400) enables you to completely migrate IBM I, iSeries, and AS/400 data to your Oracle or MS SQL environment. This means archive AS/400’s can be decommissioned and the data will be migrated to industry standard storage in the MS SQL or Oracle database. The cost of maintaining AS/400 systems for static data environments is exorbitant. Infinite can completely migrate the data to industry standard databases like Oracle or MS SQL in less than 4 weeks at a cost which is dramatically less than maintaining the AS/400 systems and storage. Once the archive data is migrated to Oracle or MS SQL it will appear as though it was natively produced data within those databases. Reporting is simple, graphical and web-based. The ability to use analytics tools to produce meaningful information from historic data becomes much easier and can be done using standard tools like Tableau. • Geographic transparency - Users do not need to know the physical location of data, just the names of the tables to be accessed. • Network transparency - Users can access the data regardless of the network protocols. • Operating system transparency - Users do not need to know the operating systems on which the data resides. • Data storage transparency - Uses can access data regardless of the methodology used for data storage. • Data access transparency - Applications can access foreign data stores using the same feature-rich language. These levels of transparency dramatically expand your ability to access and analyze data. For example, in a single request you can integrate sales information from Oracle on AIX and inventory information from Oracle on z/OS with customer information from a migrated AS/400 database without having to know where each piece of information is located or how it is stored. Such transparent data access protects your company's investment in data and applications, while extending your data management power. Unlike other database migration products that require extensive programming and customizing, the Infinite Database Migration Tool for DB2/400 is a complete, ready-to-use solution, with no programming necessary. From the first day, you can migrate all your AS/400 data to Oracle or MS SQL and use Oracle's or Microsoft’s tools, or any of the many third-party products available for Oracle or MS SQL, to access information in your former AS/400 database because it will actually be an Oracle or MS SQL Database. If your requirements change, Once migrated, Oracle and Microsoft technology makes it easy to relocate your data without changing your application programs. The Infinite Database Migration Tool for DB2/400, together with the Oracle or MS SQLdatabase, gives you a sophisticated set of services because all your data resides in a single local Oracle or MS SQL database. These services include SQL statement parsing for distribution, database link processing, two-phase commit processing, data dictionary support for Oracle and Microsoft tools, and data type conversions. The Oracle Database Gateway for DB2/400 and Oracle also provide distributed capabilities, including multisite queries, subqueries, joins, and views, all with a single SQL statement. The Infinite Database Migration Tool for DB2/400 is tightly integrated with the Oracle and MS SQL databases. 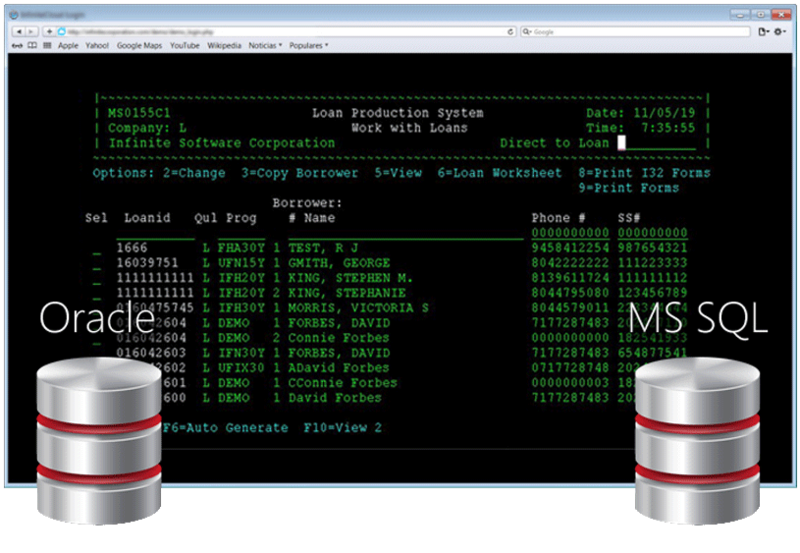 This allows Oracle's powerful SQL and MS SQL to be used against the AS/400 data. You need not learn a new API, SQL language, or AS/400-specific SQL. It allows you to fully leverage your Oracle or MS SQL knowledge today, and exploit Oracle or MS SQL language enhancements in the future. Connectivity to the AS/400 is provided by Infinite Services with support for TCP/IP. Whether you need to migrate the data from your iSeries to Linux, Windows or a mainframe running z/OS or OS/390, the Infinite Database Migration Tool for DB2/400 delivers true distributed relational database access to the AS/400 data. Unauthorized access to AS/400 data is protected through a combination of Oracle and MS SQL security mechanisms. With the Infinite Database Migration Tool for DB2/400, the tool simply takes a complete SAVF from the AS/400 physical and logical files, recompiles them into their new target platform and writes the data to Oracle in one complete set. This automatically translates EBCDIC data to ASCII and automatically creates tables and views from the original physical and logical files. This is a one-time complete data migration process. Once migrated, you can easily move data from the to workstations or PCs for data manipulation and analysis because it is all in either Oracle or MS SQL. • The Infinite Database Migration Tool for DB2/400 resides on the Oracle or MS SQL server. • Number of users limited only by underlying operating system and the Oracle or MS SQL database. • Automatic mapping from AS/400 to Oracle or MS SQL. • Access control on a per-user basis.